Recently volunteers have become busy with cleaning graves, as local residents have requested help to have the graves cleaned by the time of the equinox. 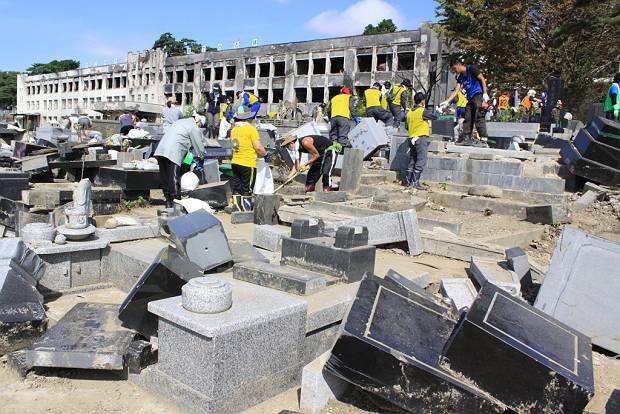 Mainly short-term volunteers have been involved with this and everyday many volunteers are spending time cleaning graves and the surrounding area. 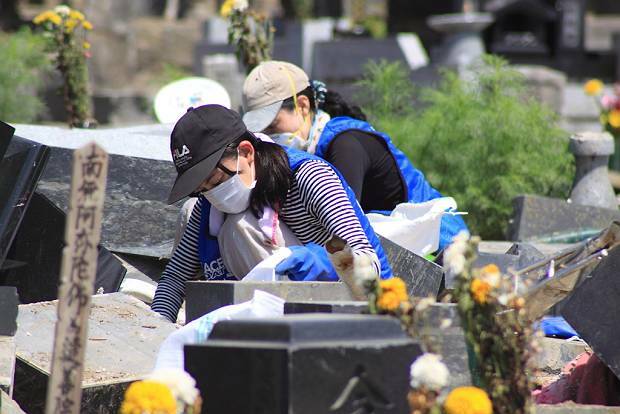 Today’s report is about such grave cleaning activities at Saikou Temple in Kadonowaki-cho. It’s been approximately five months since the disaster occurred. This is a photograph of the area before cleaning activities commenced. 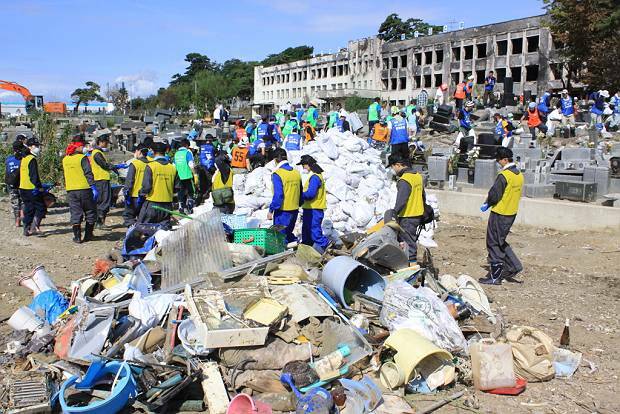 Although the cars that were washed into the cemetery by the tsunami have been removed, the cemetery was buried in sludge and debris of destroyed houses. One cannot tell where the cemetery begins and ends. 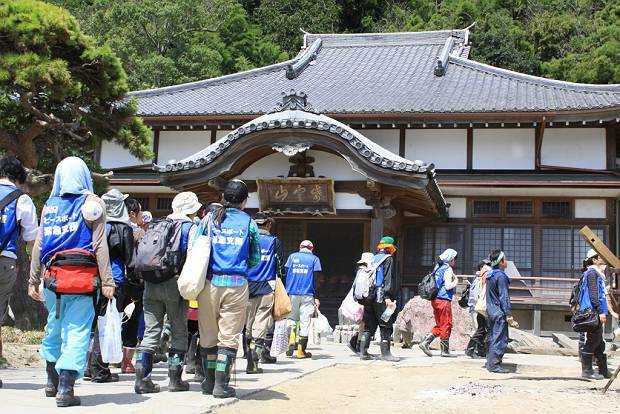 Volunteers began working in the area in the beginning of August upon receiving a request from Saikou Temple. Initially approximately 50 volunteers were coming each day to help, and since Obon (Obon is a Japanese Buddhist custom to honour the deceased spirits of one’s ancestors) there are almost 100 people helping every day. The volunteers are ‘cleaning’ but it is not quite the same kind of cleaning as say for example cleaning gutters. It’s not possible to just simply pick up gravestones and move them. The work is physically straining and needs to be carried out carefully. 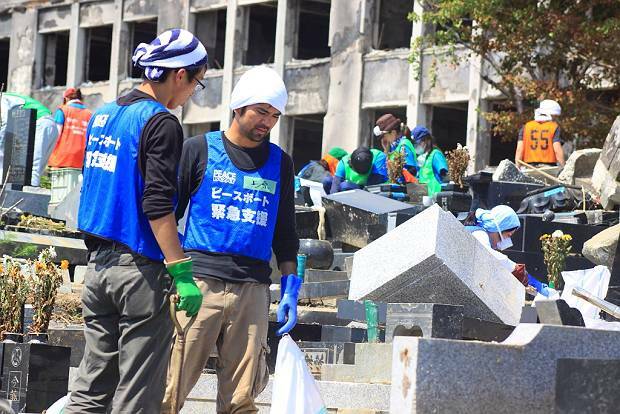 Ichijou Kenji, one of the volunteer leaders, explains to volunteers that they need to change their mindset and understand that grave cleaning is not the same as other cleaning jobs. 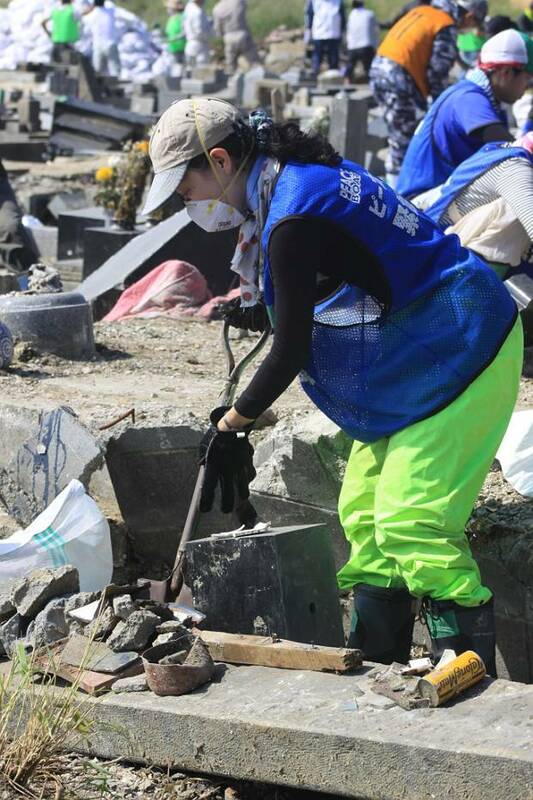 On this day, in addition to the regular Peace Boat short-term volunteers, there are corporate volunteers from Mitsubishi Corporation’s CSR department, and volunteers from NGO Habit for Humanity (hereafter, “Habitat”) who have been providing ongoing volunteer assistance since the beginning of August helping with the grave cleaning. The volunteers enter the area where they will be working whilst being careful of where they step. First of all they need to make a path. The volunteers look for where there would have originally been a path and start working to clear the way with shovels. The volunteers work under a hot sun silently and gradually, taking short breaks often. The work has to be done very carefully, and there are some situations where volunteers on their first or second day are unable cannot make judgments about how to proceed on their own. This is where the motto of “Report, Contact, Consult” comes in. This motto is important for volunteers to be able to work in an organized manner. 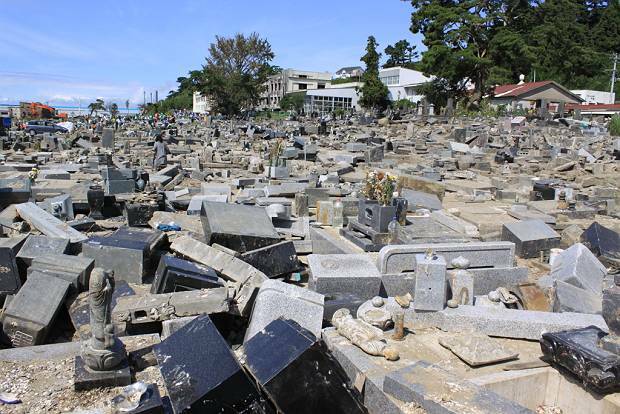 As the volunteers work, the original condition and layout of the cemetery gradually becomes apparent. After 3 weeks of work, the changes that can be seen are due to more than just cleaning. 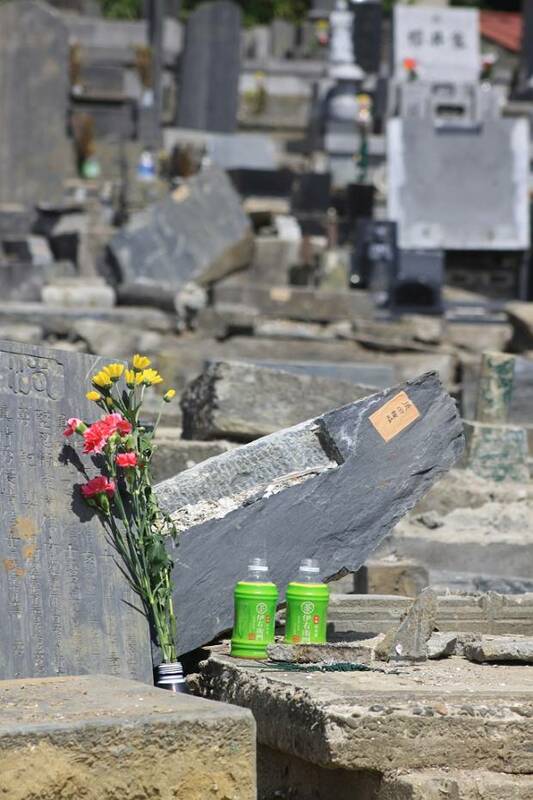 The next morning, there are flowers on one of the graves. 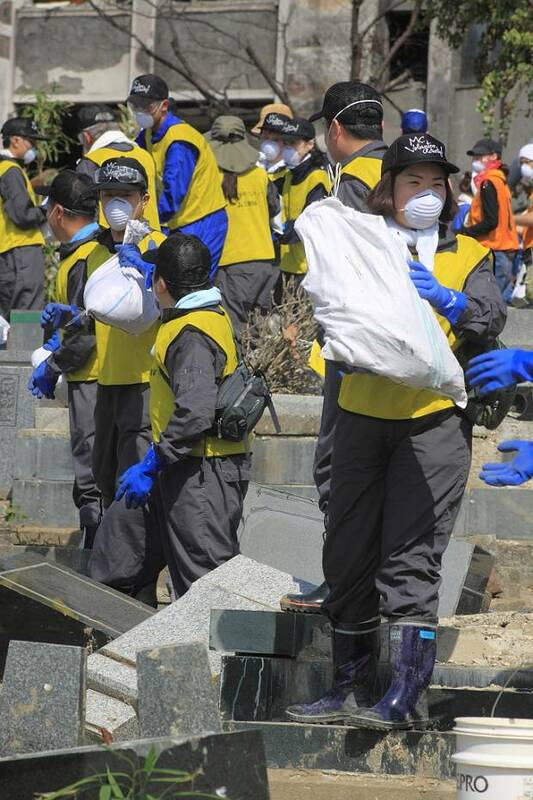 In order to get rid of all the mud and debris, it is put into sandbag bags and taken out of the cemetery by a chain of people. This requires many people to help. 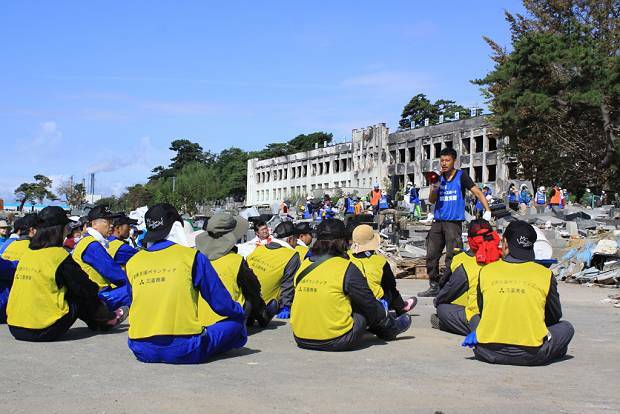 The volunteers from Mitsubishi Corporation, Habitat and Peace Boat all work together. 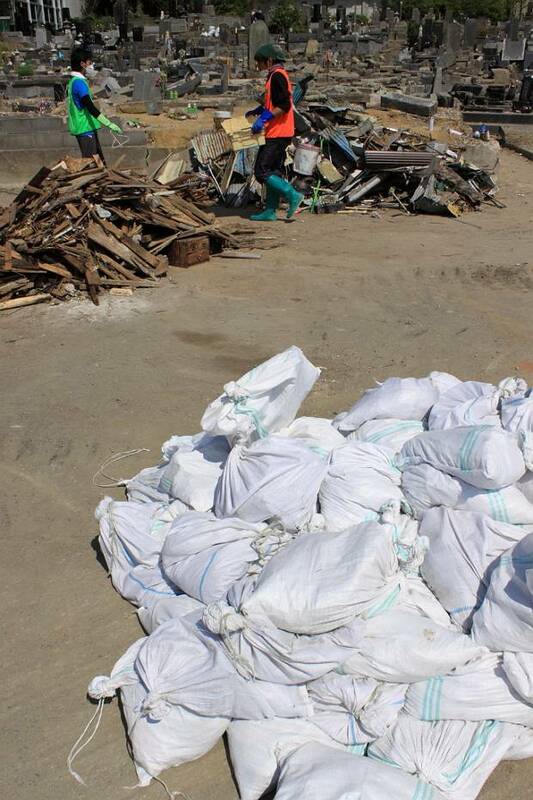 Sandbag bags (front), debris (rear left) and metal (rear right). It is important to separate what is collected through the cleaning activities. 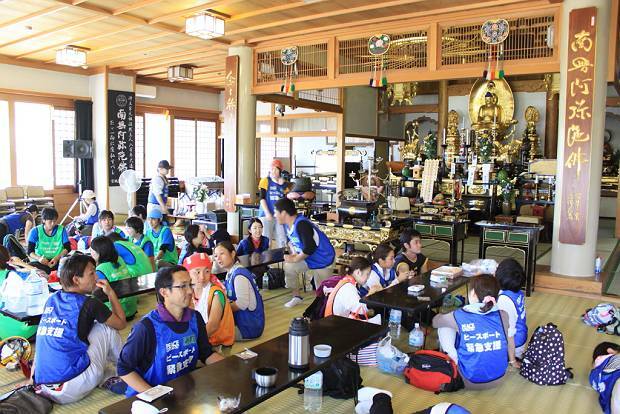 After the morning work is finished, the volunteers go into the grounds of nearby Saikou Temple, but they are not going there to worship. 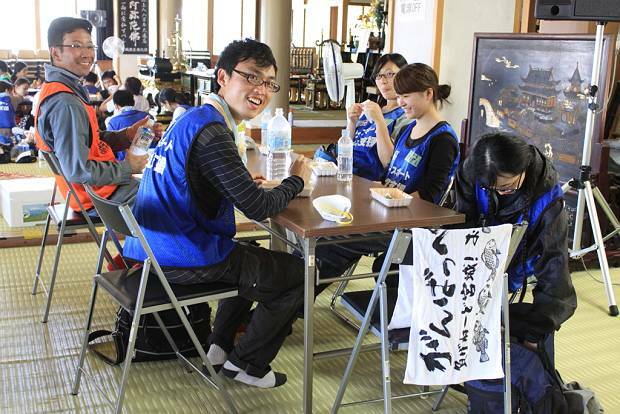 Everyone is eating lunch together, thanks to the consideration of temple master Mr Higuchi who allows volunteers to eat lunch inside the temple like this each day. It’s a nice break for the volunteers who have been working under the hot sun. The volunteers received gifts of chilled jelly and energy drinks which they appreciate very much. 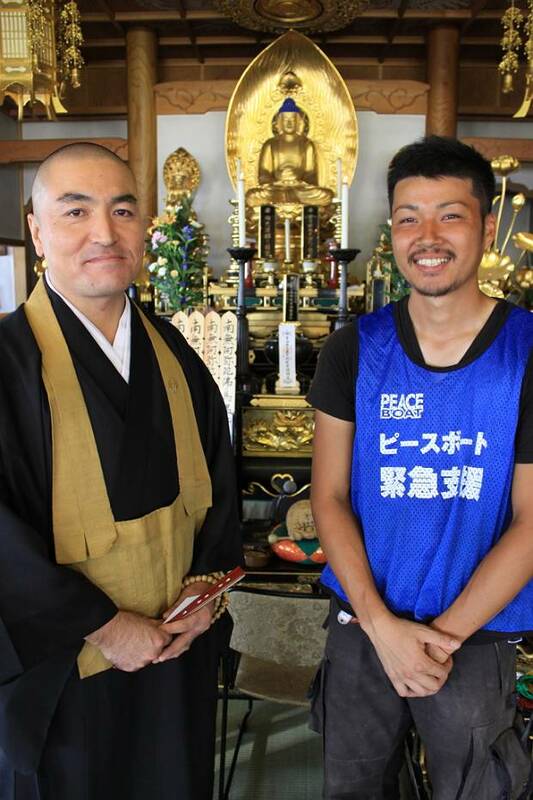 Temple master Mr Higuchi (left) and volunteer leader Ichijou Kenji. 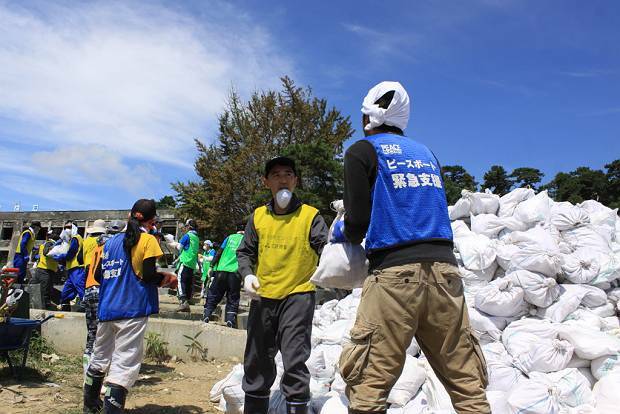 The original aim was to finish the cleaning activities near Seikou Temple by the time of the equinox. It looks like they will be finished well in advance. 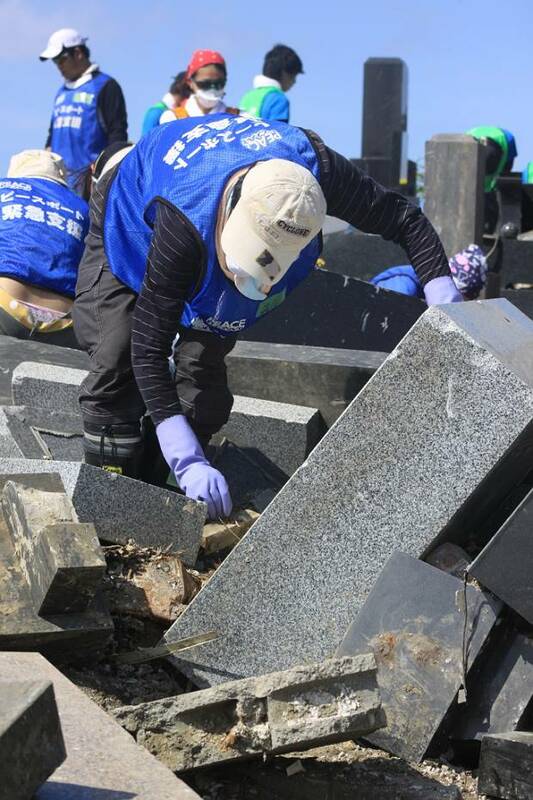 The volunteers will keep on working so that people can come to the cemetery to pay their respects as soon as possible.